Forks don't look that bad. There's been a few threads on here about using foil to clean up chrome. That a look at this http://www.radbmx.co.uk/forum/index.php?topic=52096.0 link to see what can be done with a bit of elbow grease. I agree that fork should shine up nice, I use triple zero steel wool to great effect. The right group for this bike would be a 90s Campagnolo, Shimano or similar, a friend has Mavic on a similar bike and it looks stunning. 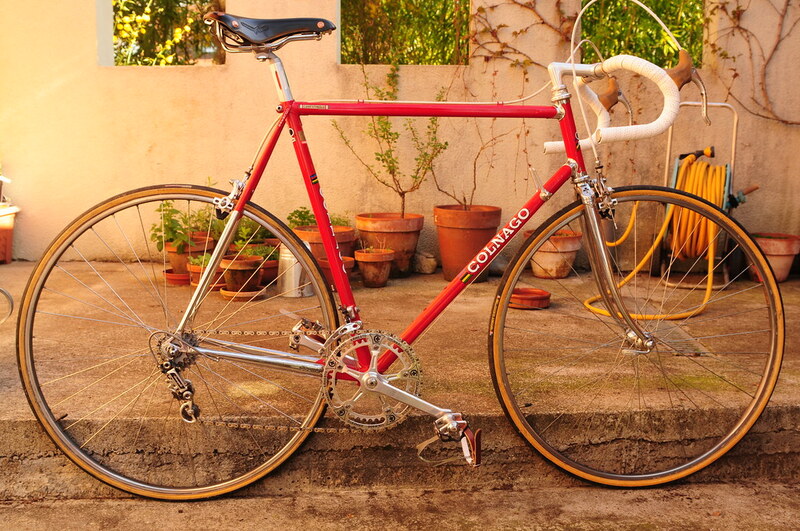 The Nuovo Gran Sport would be about 10 years earlier than this frame. Thanks for the advice on the forks, I'm going to start with a start with a strip and a good polish so will advise how that goes. Regards Wheels i was thinking Campag hubs with Mavic rims, again any advise ?? Same colour as my old Mexico. You should try to source old Super Record parts. I scoured eBay for mine and if you're patient you can get the not quite so mint stuff for a decent price. Shimano on an Italian frame! Wash your mouth out with soap, style faux pas. Ha! yes very funny and I believe Leonardo da Vinci and Tullio himself turned over in the grave at my faux pas however the real blasphemer may well be the Colnago company itself. As I look through the 40th anniversary catalog I see the team Lampre Bititan is equipped with (gasp) Dura Ace! Thanks to all for info, I think this concludes frame as a 1990s Super. Regarding the build up, I'm currently still in the place that looks like assembly with Campag chorus group set and wheel set of campag hubs (which group ??) with mavic rims, 700c of course ( interestingly nice set on eBay "Campagnolo Record 9 speed 32 hole hubs laced 3 cross on brand new Mavic Open Pro silver rims") ....................... as nobody said thats a bad idea. But I bet everyone who rode for Lampre that year felt somehow dirty and guilty. Anyway, until the bullying cheat started winning the TdF, nobody had ever won on Shimano. I rest my case.